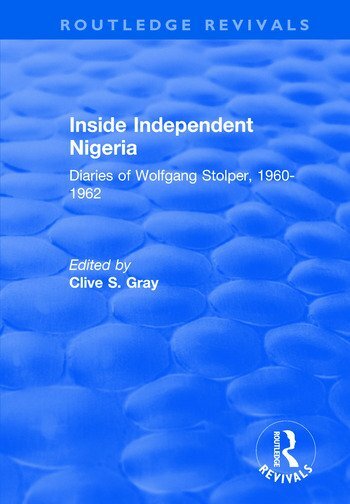 This title was first published in 2003.Wolfgang Stolper was one of the first Western economists to serve as an adviser in the government of an independent African country. In 1960 he was brought in by the Nigerian government to help shape Nigeria’s first post-independence development plan. His remarkably candid diaries chronicle his struggles and frustrations with officials, interference, waste and corruption at the heart of a government and unfolds the extraordinary story of his warmth and friendship with a country and its people. Brutally frank, compelling and disarmingly thoughtful, Inside Independent Nigeria brings to light one of the most exceptional documents on post-independence Nigeria, and delivers a fascinating picture of a pivotal era in the development of Western economic planning in Africa. No student or researcher of African political history, economics or development studies will want to be without this utterly riveting book. Contents: Editor's introduction; Cast of characters; July 17-30, 1960 Arrival in Nigeria: first impressions, first tour in the countryside; August 2-17, 1960 First tour of the three regions; August 18 - September 11, 1960 Visit to Benin, completion of first tour in Nigeria; February 1 - March 8, 1961 Second tour begins: consultations in London and Rome, first meeting of Joint Planning Committee (JPC) under Chairman (Prime Minister's economic adviser) Prasad, grubbing for planning data, Gov. "Soapy" William's visit; March 9 - April 16, 1961 Preparing first paper for the JPC, first clashes with Prasad, initial estimates of Five-Year Plan magnitudes, analysis of selected public investments, Ford Foundation team attacked in Parliament; April 17 - June 6, 1961 Rivkin mission on US aid for Nigeria's plan, JPC, trips to eastern and western regions; June 12 - July 24, 1961 Federal investment program, World Bank mission, managing the Ford team, malaria, preparing introductory plan paper for JPC and National Economic Council (NEC); July 24 - August 29, 1961 New minister (Waziri Ibrahim), macroeconomic policy, consultations with World Bank and IMF missions, JPC discusses Stolper's paper, German white elephant factories in Eastern Nigeria; August 30 - September 22, 1961 Visit to Kano, Maidugari, Lake Chad, plan drafting begins, regions pressed to submit their investment proposals; September 24 - November 6, 1961 Rivkin mission returns, negotiations with regions, "irresponsible" Eastern Region Plan, new permanent secretary Godfrey Lardner, JPC discusses plan memo; November 7 - December 13, 1961 Efforts to trim investment programs, possible stretch to six years, JPC discusses plan outline; January 21 - March 3, 1962 Cabinet debates program cuts, tensions in Ford team, corruption, integrated plan versus four separate plans, Stolper atttends NEC meeting in Ibadan; March 5 - April 26, 1962 Visit to eastern region, trip to Cameroon, Ford team's future, AID queries about plan assumptions, Parliamentary debate and vote on the plan; April 27 - June 3, 1962 Nigerian Economic Society meeting, Israelis promote farm settlements, visit to Jos tin mines and other eastern region sites, Stolper offered a job in Malta, visit to Ghana, clash with Prasad peaks, Stolper insists on coherent macroeconomic framework, disputes about projected underspending, plan completed; Postscript 1999; Addendum June 2001; Name index; Subject index. Clive S. Gray: Harvard PhD (econ. ), 1965. 1961-63 - assistant program economist, USAID/Nigeria 1964-67 - agriculture adviser, Ministry of Economic Planning, Kenya 1968-70 - Harvard team leader, National Planning Dept., Colombia 1971-72 - Harvard team leader, Planning Commission Office, Ethiopia 1972-76 - adviser, Ministry of Communications, Indonesia, and (from 1974) Harvard team leader, National Planning Dept. 1986-90 - Harvard team leader, Min. of Economic Affairs, Morocco 1970-2000 - Institute Fellow, Harvard Institute for International Development 2000-01 - Senior Fellow in Development, Kennedy School of Government, Harvard University Wolfgang F. Stolper: deceased. Studies of Law at University of Berlin, and Economics and Law at University of Bonn, early 1930s. Harvard PhD (econ), mid-1930s. Professor of Economics, University of Michigan, -1980 Founder-Director, University of Michigan Center for Research on Economic Development . Visiting fellow, MIT Center for International Studies, 1958-59. Director, Economic Planning Unit, Federal Ministry of Economic Development, Gov't of Nigeria, 1960-62 Visiting fellow, Harvard University Center for International Affairs, 1962-63.